Crown or collar rot has caused extensive death of apple trees in many eastern orchards during the past two decades. It often occurs on trees between 3 and 8 years of age grown on Malling-Merton 104 (MM. 104), MM. 106, and, to a lesser degree, MM. 111 rootstocks. The disease often affects low areas of orchards having heavy, poorly drained soils, but it can affect all orchard sites if trees are first infected in the nursery. The first symptoms to appear in the spring are delayed bud break, leaf discoloration, and twig dieback (fig. 1). These symptoms are not diagnostic, but are merely general indicators of trunk girdling or root disorders and indicate that crown infection is advanced. Typically the tree blooms heavily, and fruit remain small and color prematurely. Infected trees may survive the growing season but show symptoms of leaf and bark discoloration and premature coloration and leaf drop in the fall. Infected trees usually decline progressively over several seasons. Crown rot and collar rot are names applied to this disease based on location of the symptoms. Collar rot symptoms occur on the scion portion of the tree near the graft union, while symptoms on the root stock are referred to as crown rot. This disease is most commonly found on susceptible rootstocks. Infections may progress slowly from the base of roots and occasionally occur on various portions of the root system. Figure 1. Thin foliage of a weak-looking apple tree affected by Phytophthora root rot. Photo: Wayne F. Wilcox, Cornell University. Figure 2. Bark removed shows typical reddish brown discoloration associated with Phytophthora root, crown, and collar rot. Photo: Kenneth D. Hickey, Penn State University. The most obvious symptom found on infected trees is a partial or complete girdling of the trunk (fig. 2). Close examination of the roots often reveals reddish brown, water-soaked areas of necrotic tissue located at the base of the root at the point of attachment to the rootstock. The entire underground portion of the stem is usually water-soaked and brown, and the necrotic area usually extends upward to the graft union. Healthy and diseased tissues are separated by a distinct margin that may not be visible without removal of the outer layer of bark to expose the inner phloem tissue down to the cambium. Diseased tissue at first appears orange- to red-brown, later turning dark brown as decay progresses. Older cankers form a definite outline with age, and callous tissues may develop at the margins. The girdling symptoms caused by collar and crown rot may also be caused by fire blight in the rootstock, borers in burr knots, voles, mechanical injury, and graft union necrosis (tomato ringspot virus). Because of potentially serious losses from each of these problems, early accurate diagnosis is a prerequisite to a successful control program. The pathogen belongs to a group of fungi known as water molds that require high levels of moisture and cool temperatures for growth and reproduction. It may survive in soils for several years in a resting spore (oospore) stage that is resistant to drought periods or chemical treatments. Old orchard soils are known to contain large numbers of oospores. A mobile spore type (zoospore), which can move when soils are flooded or contain high levels of moisture, is the most important source of new infections. 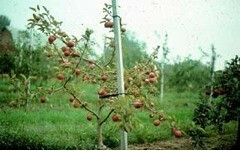 The pathogen can also survive over winter in infected trees or in colonized fallen apple fruit. The fungus favors cool (50°F-60°F; 10°C-16°C), wet soils. New infections are most numerous between the pink stage of blossom development and the beginning of shoot elongation. The susceptibility of scion bark tissues is believed to be affected by the rootstock, being greater in trees of high vigor. Secondary spread of the disease to new trees is greater in heavy soils during wet springs or when frequent irrigation is practiced. To identify the disease, observe trees in plantings between 3 and 10 years of age grown on susceptible rootstocks for the delayed bud break, leaf and bark discoloration, and twig dieback that are characteristic of the collar rot symptoms on the scion. Examine affected trees more carefully for the crown rot symptoms on the rootstock. 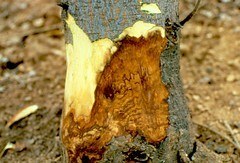 These symptoms are reddish brown, water-soaked areas of necrotic tissue on the lower tree trunk and rootstock. Larger roots nearer the surface may show similar symptoms. Be aware that damage to a susceptible rootstock by this disease may induce rooting from the scion which, in turn, will mask or delay the above symptoms of tree decline. Observe orchard blocks with susceptible rootstocks for additional trees showing symptoms which may have developed after fruit set. Severely girdled trees often show premature coloration and leaf drop in the early fall. Mark infected trees for treatment or removal depending on infection severity. You can minimize the occurrence of Phytophthora root, crown, and collar rot through careful selection of orchard sites and rootstocks for new plantings. Avoid planting susceptible rootstocks in areas with heavy, poorly drained soils. Because a number of Phytophthora species cause root, crown, and collar rot, it is difficult to make absolute statements about the relative susceptibility of different rootstocks to these diseases. Several fungicides are registered for the control of Phytophthora root diseases. They are not a substitute, however, for good site preparation and the use of rootstocks adapted to the intended orchard site. Chemicals should be used as a preventative measure. It is difficult to eradicate the pathogen from the roots after infection is established. For more information, see Table of rootstock susceptibility to Phytophthora. Original text prepared by K. D. Hickey and K. S. Yoder.